The Driftars are the closest sound you'll get to the original Drifters, you won't believe your ears. The Driftars have performed with the very best of the best including past members of the Drifters line-up such as Ben E King, Billy Lewis and Tony Jackson. 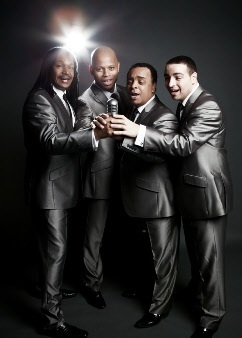 Their aim is to keep the spirit of Motown alive and kicking around the world. Weave their Motown Magic into the hearts and minds of every generation, encouraging the passion for Motown that they themselves have ! The Driftars have a range of show options available to perform at any sized venue and to suit every occasion and budget. Each show takes the very best of The Drifters, Soul, Motown, Funk and Disco and mixes them together to bring you a show-stopping performance every time! Book the Full Show comprising the Driftars plus their backing band 'The Detroit Groove' which is a 4pce or 7pce band. they have their own PA and Lighting System with sound engineer, but if you wish to provide your own PA and Lighting that's OK too. There is also the option of The Driftars using backing tracks and your own sound / lighting system. The Driftars are happy to accommodate whichever option you choose.